Should You Be Worried About Your Concrete? | Omaha, NE Real Estate Agents The Bill Black Team Video Blog Omaha, NE Real Estate Agents The Bill Black Team Video Blog: Should You Be Worried About Your Concrete? Should You Be Worried About Your Concrete? Whether you are in a newly-built home or not, you have cracks in your concrete. Today we are going to discuss what different cracks in concrete mean, and when you should be worried about them. One thing that a ton of our clients have been asking us a lot about is the cracks they see in their concrete. The first thing we would say about that is that cracks are very common, even in brand-new multimillion dollar buildings, like the one feature in our above video. 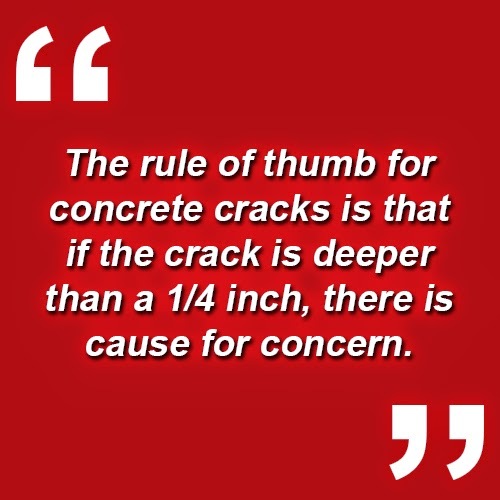 The rule of thumb for concrete cracks is that if the crack is deeper than a 1/4 inch, there is cause for concern. However, if the crack is less than a 1/4 inch thick, you have nothing to worry about. It's normal, especially in Nebraska, to have lots of small cracks in the concrete in your home. If you have any questions or concerns about the concrete in your home, be sure to give us a call or send us an email. We would be glad to help you with whatever you need.